When the time comes to refurbish and redecorate, it’s very tempting to play it safe, with a neutral colour scheme, plain white tiles and a fairly standard bathroom suite. Whilst there’s certainly nothing wrong with such an approach, it could result in a space that simply doesn’t reflect your personality. If you really want to ramp up the style and produce a bathroom design to be passionate about, it pays to be bold, using darker, deeper colours, adventurous shapes and patterns and new technology, to produce a more immersive and dramatic setting. Throughout this style guide, I’ll be showing you 3 different ways in which you can be bold with your bathroom. Why not take a look at this short yet inspirational video first? When choosing your bathroom style, it may seem like a simple choice between contemporary and traditional styles. For the uninitiated, contemporary means something that is fashionable now, following the latest trends, whilst traditional style usually includes ornate designs which have a timeless appeal to them, echoing classic interiors from bygone eras, like the Victorian and Edwardian periods. However, one increasingly popular approach is to mix things up, without sticking to one distinct style, creating what would be termed an “eclectic” look. To help you get the look, I’ve produced a mood board which will give you a flavour of my own Eclectic Vision bathroom. As you can already tell, this bathroom uses a monochrome palette as a base, with a combination of both traditional and contemporary products. We’ve introduced rose gold to give the metallic finishes an on-trend edge. Don’t be afraid to go a little glitzy with your choice of tiles and wall panels. Your choice of bath is the perfect way to combine 2 different styles. 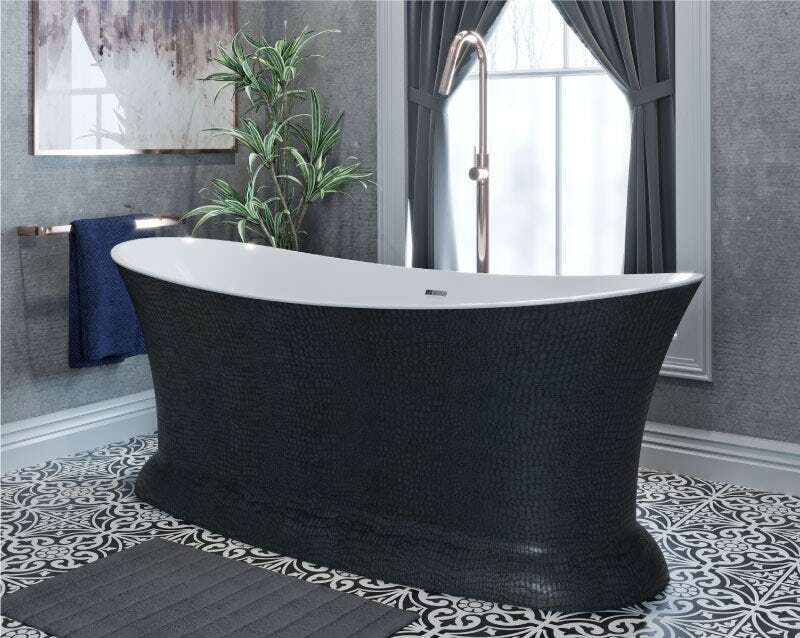 The Botero croc skin effect freestanding bath features a classic bateau shape, whilst the black, textured surround provides a deliciously dark element. To complement and contrast, the contemporary style Spencer freestanding bath tap comes in a sumptuous rose gold finish. Take a more in-depth look at this bathroom in our Eclectic Vision style guide. Another great way to be bold with your bathroom is to add a more futuristic aspect to your design. With the latest in high-tech gadgets, you can turn your space into a smart bathroom, in more ways than one. By using rich colours and being more daring with your lighting, your bathroom takes on a more contemporary form with hints of neon producing a more urban look and feel. 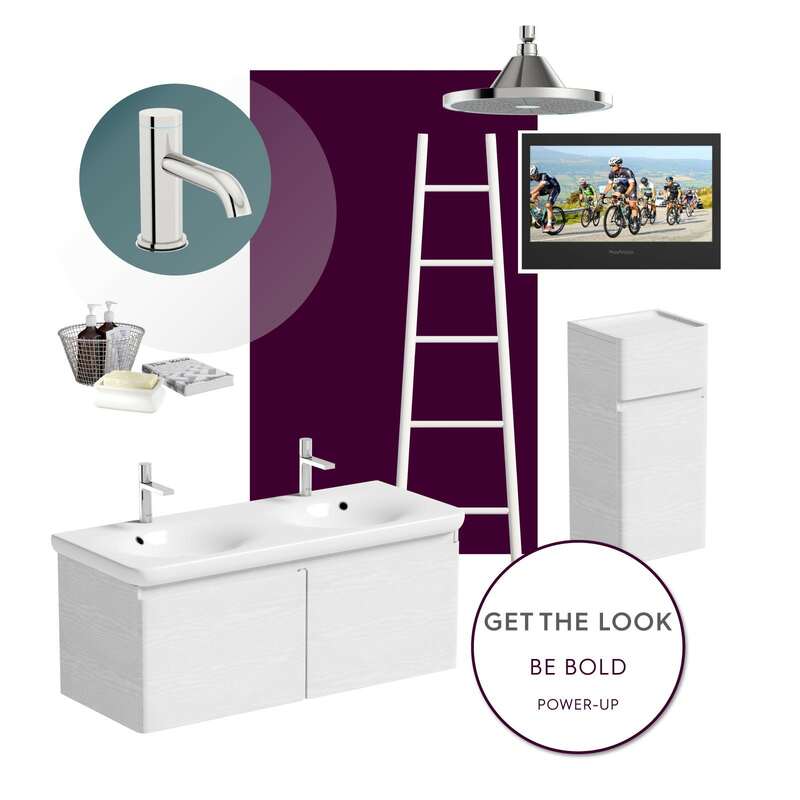 We’ve named this look “Power-Up” as your added technology really will enhance how you use your space. To give you a flavour of this look, I’ve produced a mood board. Bold colours, LED lighting and darker walls and flooring combine to produce a space-age design that will certainly be the envy of anyone who sees it. The wet room shower enclosure contains some genuinely futuristic elements. 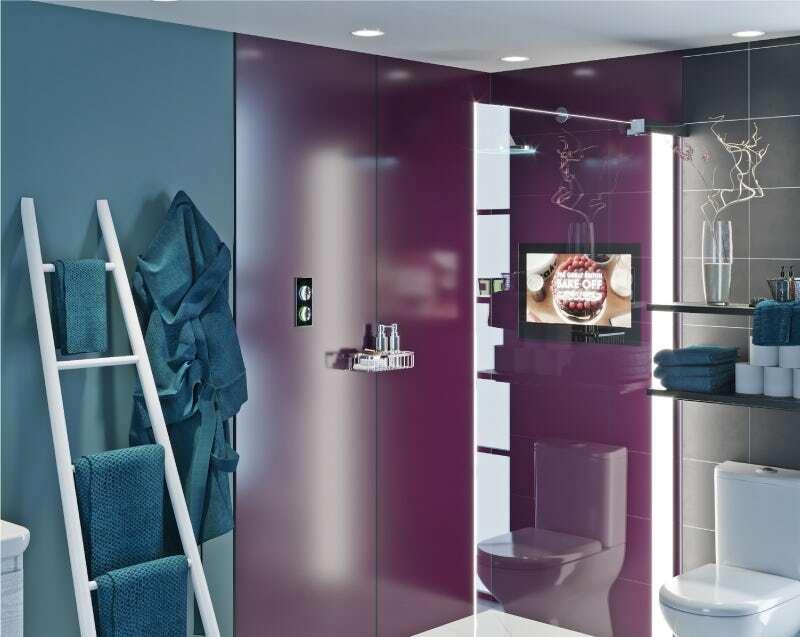 A splash-proof bathroom TV means you never need miss out on your favourite shows, whilst the SmarTap smart showering system with LED shower head indicates when your water temperature is just right. Monochrome bathrooms have been popular for a while now, yet many people feel too scared to give them a go, preferring to stick to a blend of neutrals or light colour schemes. 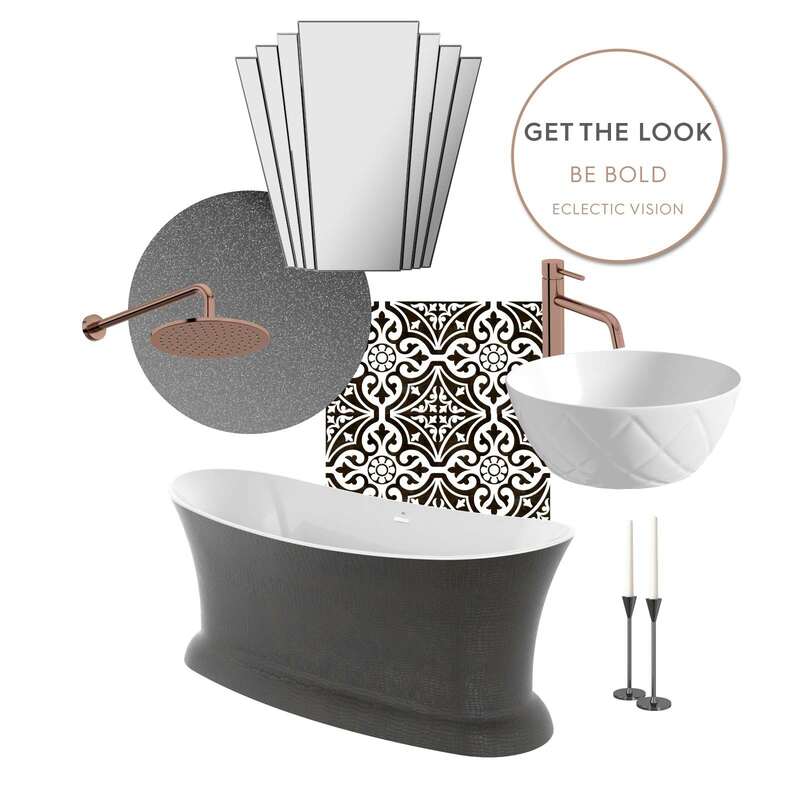 However, with darker, more theatrical settings set to be a big trend this year, I’ve created a contemporary bathroom that uses monochrome to the max! To help you visualise this look, I’ve produced the mood board below. 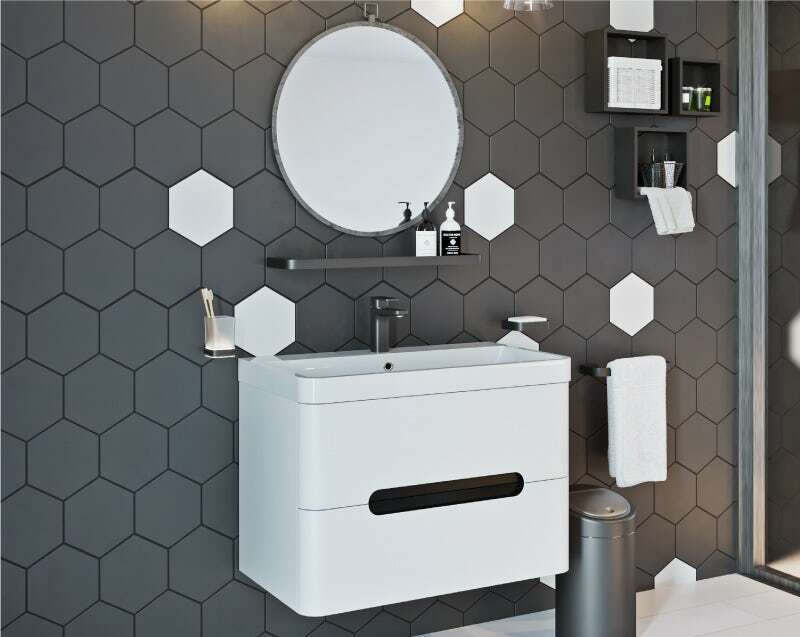 Hexagonal tiles are very on-trend and can be used to add a designer feature to your walls. I’ve also picked out black surfaces where you might not expect them, on taps and the shower tray. The Ellis vanity unit is the perfect way to contrast black and white elements. The gloss white reflects light, whilst the black handle insert adds an accent colour without dominating proceedings. If you already like what you’ve seen, you can shop the look today with our dedicated collection. Simply click on the banner below to begin browsing. 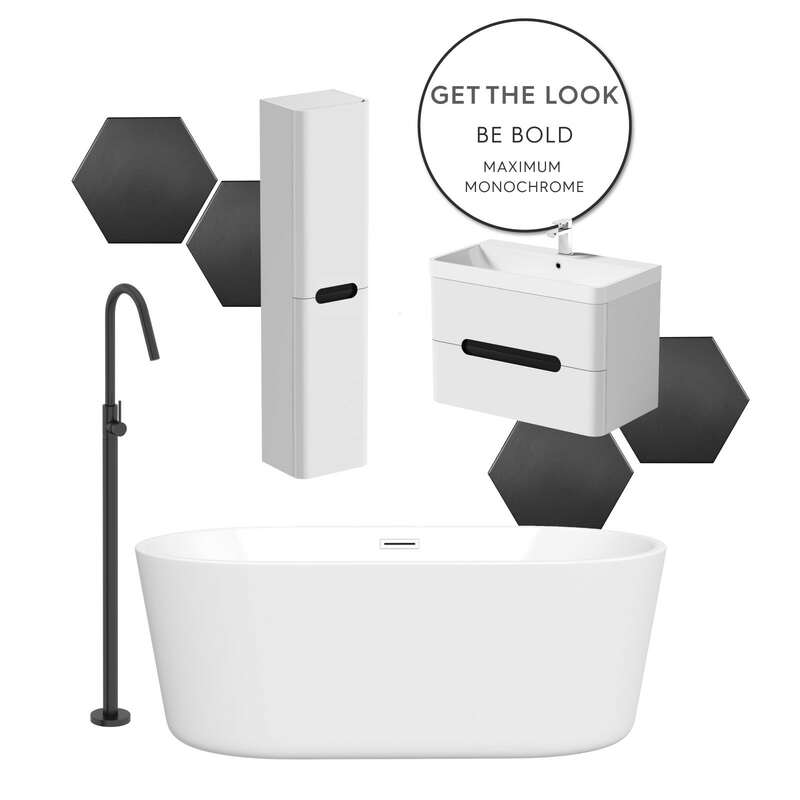 If you'd like to take a more in-depth look at our "Be Bold" bathrooms, click on the link below.